After nearly thirty years of living and working abroad, Adam had returned to England the previous month. Now in his fifties he had journeyed across Europe to London, then to Newcastle where he had rented a flat for 6 months while he considered his future. Then just the previous week he had vowed to return to the town where he had grown up. 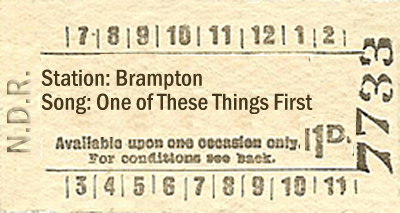 Having tried so fervently to get away from the place all these years ago, he was at a loss to understand his sudden yearning to return to Brampton. It was rather like a salmon returning up river to where it had spawned. The previous night he had gone out to a pub in the Metro Centre, drunk too much whisky, returned to his flat and had then drifted off to sleep with his i-pod playing a selected playlist on repeat. Now he couldn’t get one of the songs out of his head, possibly the one that had been playing as he drifted from that land between sleep and waking. He answered himself with a smile, “Well by train of course, and here I am”. It was that song again. As he mulled over his past thirty years abroad he could hear its gentle refrain and the lines, “I could have been a sailor, or a cook” and he thought to himself smugly that funnily enough he had been a sailor and a cook and in fact had on many occasions been “a real live lover”. So at least he’d got one over on the singer of that song as he had been there and done it already! The same song had gone on to suggest the singer’s attempt at being as “steady as a rock”. Why? What was the point in that? Hadn’t Adam always been as steady as a rock, reliable and trustworthy to his friends? Had he had similar treatment in return? No. That was the hurtful part. He concentrated hard to get the song out of his head and even started to hum a U2 song for variety. “With or Without You” from that over-rated Joshua Tree album. That attempt lasted all of 30 seconds when he realized that the train was already slowing to a halt. The music stopped in his head. The train journey from Newcastle to Brampton had taken just over an hour and once he had alighted at Brampton railway station, it was about a mile walk into town. He was noticing things that he had never noticed before in his young days. How smart the red sandstone buildings looked. How clean and tidy the streets appeared. He passed St Martin’s Church and remembered that as a youngster his parents would force him to attend there on Sundays. He contemplated how willingly he would attend now but was unsure why. In search of spiritual guidance? Next he passed the octagonal Moot Hall right in the Centre of Brampton where he had met his first date as a sixteen year old lad. He had taken Christine Graham to the pictures in Carlisle to see Cabaret. And wasn’t he smitten? A pang of nostalgia came upon him in an emotional wave as he wondered where his first love was now and regretting how that had ended. A change of mood descended upon him. “I could be yours so true. I would be, I should be, through and through”. He reflected back with sadness and quietly muttered under his breath, “Well why hadn’t I been?” He had spent 30 years trying to find true happiness in every possible way but why hadn’t he been Christine’s, through and through. Wasn’t that the title of the song? And that one thing that he could have been was her “real live lover” but in his hurry to get away from Brampton, he had abandoned that particular relationship before it had ever really got started. Oh, how first love is the sweetest. Now he felt a certain affinity with the singer! Sadly he made his way back to the railway station and decided that it would be best to head back to Newcastle where he could escape the memories. Sometimes places were different, not through redevelopment and improvement, but because of the people that are no longer there. Different and not for the better. The song had stopped playing in his head as if its relevance had been realised.